Ah, the age-old comparison for homeowners in the market for replacement windows: vinyl vs. wood. Ok, “age-old” is a little dramatic. But it is a long-standing comparison in the world of [literal] window shopping by homeowners. And, with the multitude of window options available today, one could find it very difficult to filter through all of the information and decide which replacement windows are best suited for the home. One of the great challenges during this “filtering” process is to decide which window material is right for you. 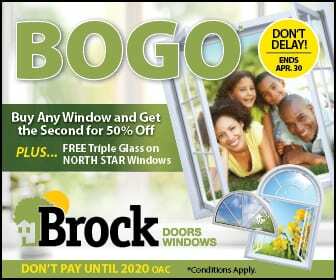 Our team at Brock Doors and Windows wants to help you get started here in Brampton, ON. Together, let’s go over the pros and cons of the two most common window frame materials on the market today: wood and vinyl. At some point, most homeowners have asked themselves the same questions: are wood windows better than vinyl? which is more cost effective? what are the differences between wood and vinyl replacement windows? This article will go over all of that so you can make the best, most informed decision! Are wood or vinyl windows more energy efficient? This is a tough one to answer. Both materials perform similarly when it comes to energy efficiency. Vinyl and wood are both known as excellent insulators, so if you were to choose based solely on this comparison—you could roll the dice and be pleased with either selection. How does the upkeep compare? Answered plainly, wood windows require more maintenance than vinyl. Wood frames should be re-stained or repainted every three to four years to keep them in top shape and protected from the elements. On the other hand, vinyl windows require very little of you to remain in top condition. After installation, they will never need to be re-stained or repainted. Are there custom options for both? Truly, there are more customizations for wood windows than there are for vinyl—because wood can be painted and stained to alter their look as your home evolves over the years. Vinyl doesn’t have this “changeable” option. But, this does not mean vinyl can not be customized to suit your Toronto home! Vinyl replacement windows come in a variety of colours, finishes, and faux woodgrain to match your home’s aesthetic. And, both wood and vinyl windows can be customized to fit unorthodox opening sizes and shapes. And, both allow for various glass and hardware options. If you want to learn more about the differences between wood and vinyl replacement windows in Brampton, ON, come visit the Brock Doors and Windows team today! We look forward to it!